NICE WARM-UP TODAY: Temperatures are mostly in the 30s across Alabama this morning… and colder pockets across North/Central Alabama are around the freezing mark. We expect a nice warm-up on this Valentines Day with temperatures reaching the mid 60s this afternoon with a partly sunny sky. Clouds will increase tonight as moisture levels rise. TOMORROW AND THE WEEKEND: A surface front, with little upper support, will drift down toward the Alabama/Tennessee state line tomorrow, and we will mention the chance of scattered showers during the day. The better coverage of rain should come tomorrow night as the front eases into the northern part of the state. The day will be mild with a high in the 60s. For Saturday, the latest guidance now suggests the front will actually make it as far south as U.S. 80, meaning the best chance of showers will come over the southern half of Alabama. For the northern and central counties, the chance of rain looks relatively low for now, and the sun might even pop out at times. Saturday’s high will be close to 60 degrees. The front moves northward Sunday, and the coverage of showers should increase statewide by afternoon and into Sunday night. The day will be mostly cloudy and mild with a high between 67 and 70 degrees. FOOTBALL WEATHER: The Birmingham Iron hosts Salt Lake City Saturday at Legion Field (1:00p CT kickoff)… the sky will be mostly cloudy, although the sun could break out at times. Just small risk of a shower, and the temperature will hover around 60 degrees during the game. NEXT WEEK: Monday will be mostly cloudy with a shower possible, but soaking rain is likely statewide Tuesday and Wednesday as a wave of low pressure moves through the Gulf Coast states. 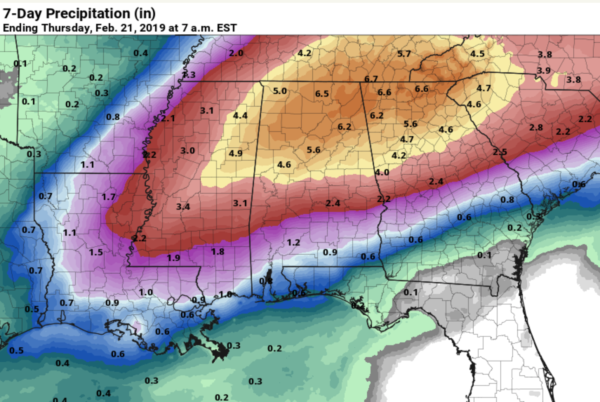 The latest guidance from WPC (NOAA’s Weather Prediction Center) suggests rain amounts could exceed five inches over North Alabama over the next seven days. We will need to monitor for possible flash flooding issues Tuesday and Wednesday. 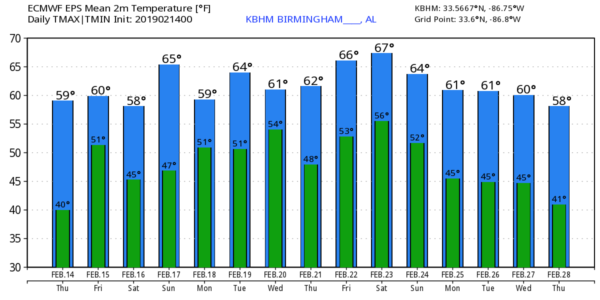 The end of the week looks dry, and there is still no sign of any excessively cold air for Alabama thorough the rest of the month. See the Weather Xtreme video for maps, graphics, and more details. ON THIS DATE IN 1895: The greatest snowfall in the history of Houston, Texas occurred on the 14th and 15th. The Houston area saw 20 inches of snow. I have a weather program this morning at Oak Grove Elementary… be looking for the next Weather Xtreme video here by 4:00 this afternoon. Enjoy the day!